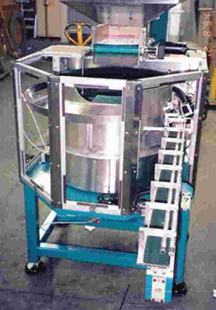 Custom Solutions - California Vibratory Feeders, Inc.
Multi-Lane Bowl Double or triple output for high speed assembly. Automated Assembly Equipment / Automatic Packaging Machine Feeder 10 feeder bowls with hoppers and escapement mechanisms with variable counters. Each bowl may be used for a different type part (e.g. 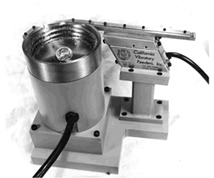 nuts, bolts, washers, screws) to automatically make up kits. 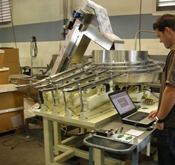 The collected parts are conveyed to a packaging machine and packaged at a rate of up to 150 kits per minute. Multiple parts/sizes/styles can be fed from one or more bowls. Please contact us with any questions you have. We look forward to hearing from you!